2019 SUMMER CAMP REGISTRATION IS OPEN! SAVE 10% ON SUMMER CAMP WHEN YOU REGISTER AND PAY IN FULL BY 3/31/19! BACK BY POPULAR DEMAND: Five-Star's FULL and HALF DAY weekly intensive camps. Spend your summer perfecting your skills in the activity you are most passionate about or try out something new! AM sessions are offered in Acro-Tumbling, Gymnastics, and Parkour and run from 9 am-12 noon. PM sessions are offered in Acro-Tumbling, Gymnastics, NINJA WARRIOR, and Parkour and run from 1 pm-4 pm. Campers will work with instructors to learn new skills or improve upon existing skills in a relaxed, safe, and fun environment. Choose a FULL DAY session and spend your morning in Gymnastics and your afternoon challenged by our Ninja Warrior course or start with Acro-Tumbling and then put those flipping skills to work in Parkour in the afternoon. We provide lunch to all FULL DAY campers. Registration is now open. Pay in Full by March 31, 2019 and save 10% on camp tuition. Sibling discounts are applied upon registration. NEW FOR 2019: TRANSFORM YOUr SUMMER fitness camp for children aged 5-17 years. A lot can happen over a summer! Transform your child's in 2019 by partnering with our fitness professionals who will help to strengthen your camper's self-esteem through fun fitness in a completely safe and accepting environment. Our 20,000+ square foot sports facility provides the perfect backdrop for a healthy combination of exercise, movement, education, and recreation. 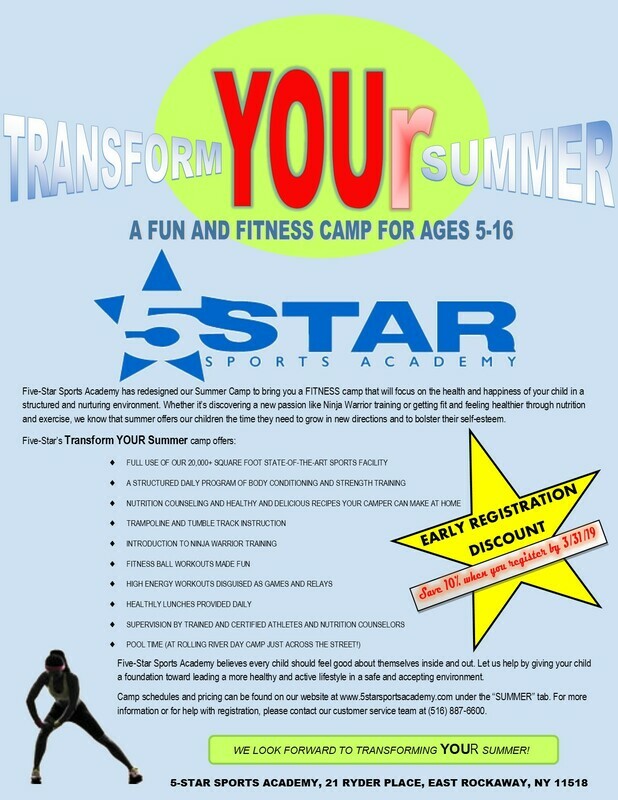 If your child is ready to embrace their overall health this summer while making friendships that will last a lifetime, Five-Star's TRANSFORM YOUr SUMMER fitness camp is for you! Healthy lunch choices are provided to our TRANSFORM campers daily. Registration is now open. Pay in Full by March 31, 2019 and save 10% on camp tuition. Sibling discounts are applied upon registration. With 48 hours of receipt of registration: $50.00 Insurance and Registration fee processed for all campers who are not currently enrolled in Five-Star's 2018-19 class session. March 31, 2019: PIF promotion ends. Save 10% off the total tuition when you register and pay in full before this date. April 15, 2019: First half of camp tuition due. June 15, 2019: Second half of camp tuition due. All payments are nonrefundable but may be eligible for account credit on a case-by-case basis. Sibling discounts apply for families with more than one camper enrolled. Discount goes to 2nd, 3rd, 4th, etc. sibling. Please contact Nicole in Billing at nicoled@5starsportsacademy.com for tuition questions regarding Summer Camp. All other inquiries should be directed to FIve-Star's customer service team at (516) 887-6600.